Beach front flats looking over Kings Beach. They must have wonderful views of the area. Sea gulls coming in to land. The wetland provides a quiet haven for the many birds that frequent the area. In the backgrond is the tank farm and the ore dump. Every now and again one comes across a gem that you did not know existed, like this wetland at Kings Beach, which is made brighter by these gazanias. In the background you can see one of the fuel tanks at the tank farm and the manganese ore dumps, that will hopefully be relocated to Coega. These have always been a blight in the area and all efforts to have them moved, up to now, have proved fruitless. Walking on the harbour wall is not allowed, but if you climb the dunes you can get a good view of what is happening in the area. The bay was very calm on Sunday with very little wind, but it did not deter this yacht from going out. It is a comfortable walk from the Kings Beach parking lot to the harbour wall. There is always something happening in the area. On some days you will see dolphins swimming past, or you can watch the water sport, or just enjoy the the variety of sea birds that frequent the area. In the thirty years that we have lived in Port Elizabeth, we could probably count the number of times we have been to Kings Beach on one hand. The reason being that we have always gone to other beaches. Today I felt the need to go for a walk and while Sue was busy preparing for an exhibition, I took a stroll on Kings Beach and had such a good time, it could become one of my favourite places. Time to take a break from climbing bell towers and checking out the view and have some dinner. Tonights choice is Aviators Pub and Grub, which is located in Allister Miller Drive alongside the Airport. It has a distinct aviation feel and atmosphere and serves a great steak. The aircraft is an Impala MkI. It was used as a trainer in the SA Airforce but has long since pensioned off. This is a multi-tasking tower. It is a bell tower, a monument, and a clock tower. This latter function was not working too well until recently, as the clocks had stopped. Because watchmakers are becoming a very rare breed, and maintaining large clocks like this is an expensive business, the City Council battled to sort out the problem. Luckily the funds and expertise finally came together and the clocks are now running like.... well.... clockwork! Here is the mechanism that drives the clocks, taken from way up inside the tower. Back at the Campanile, no longer looking outwards, but upwards. We were very lucky to be allowed into the bell tower, so we can share with you views which few people have seen. The Campanile boasts 23 bells, the most in any tower in South Africa (the next one in Gauteng has 10). It is an extremely tight fit up there, even trying to stitch pictures together is impossible, so we can't really show them all, but they are lovely. I love the soft green patina they have acquired over the years.The biggest ones are so thick and heavy that you can't feel the thickness with one hand. They were donated by prominent citizens, and some of the well known names in our history are embossed on the sides of the bells. We spotted Frederick Korsten (after whom the suburb was named), Sir Rufane and Lady Elizabeth donkin, from the women of Port Elizabeth, the Jewish community, Captain Francis Evatt (this must have also been dedicated to him posthumously by the donor), but many of the smaller bells were attached to the roof and we could not see their sides. This "bum" view of Max will give you and idea of the scale. Another picture taken at Homeleigh farm (see yesterday) as the sun went down. The little wooden tower is part of the kid's play area. We still want to show you a few pix in the Campanile series, but my laptop is caput, so until it is fixed they will have to wait. So let's go for a stroll in the country instead. On the outskirts of town are several areas of small holdings and small farms. One enterprising owner along the KraggaKamma Road has turned his farm into a popular place incorporating a Touch farm, where kids can come and interact with a wide assortment of animals, as well as a wedding venue, restaurant and large fields for setting up marquees for functions. Wandering around the farm at sunset, we came across this delightful scene. In showing you so many images of the historic areas and beachfront on this blog, there is a danger that we could give the impression that this is a quaint holiday resort. The truth is that, despite being a delightful place to visit and live, PE is primarily an industrial city, and at the heart of the industries which drive the City's economy is the motor industry. Here, while catching our breath at the top of the Campanile, and looking East, we see VWs and Hummers waiting to be loaded into one of the huge container vessels which frequently come into the harbour. On this day, the port was unusually bare of shipping, but you can see the little fleet of tugs which shepherd the large ships in. They look tiny from here but when you are on board they are not so small at all. After climbing the 204 steps to the top of the Campanile, aside from being out of breath, you get a great 360 degree view of the city. This is the Westerly view, looking towards the Donkin Reserve. Prominent Port Elizabeth landmarks, from the left are: the Edward Hotel; the lighthouse, which is no longer in use; the memorial to Elizabeth Donkin (after whom Port Elizabeth is named), wife of Sir Rufane Donkin, who administered the then colony from 1820 to 1821; the spire of the Holy Trinity Anglican Church and alongside it the original Grey Institute building, which has been beautifully restored. The Campanile was built in 1920 to mark the centenary of the arrival of the 1820 settlers who came from Britain to help populate the frontier of the Eastern Cape. Another PE landmark, this roadhouse has been around as long as I can remember. It is one of the few old fashioned drive-in restaurants still around (the new breed of franchise drive thrus is somehow not quite the same.) This is the good old "flick lights for service" type, and as a bonus, it is situated on the beach with a spectacular view across the bay. Softserve anyone? This stunning old building on the corner of Cape Road and Eastbourne Road has been a familiar PE landmark for many years. Until fairly recently, it was a guesthouse called Richly House, and a whole row of houses along Cape Road were bought up and painted the same colour as part of the complex. Then this lovely old double story was converted into an Irish Restaurant, but sadly it seems too much was spent on the conversion, and it did not last long. So it got yet another coat of paint, and is now Dagwoods. It is cool sitting on the balcony, chilling over a good meal, and watching the world go by! The beautiful old Victorian Railway Station in PE underwent a renovation in the mid 80s. The round painted panels depicting scenes from the city were commissioned, and painted by Bernard Horn. A great restaurant was opened and the Station Restaurant was the in place for a while. They served all sorts of exotic African meats, like Zebra and crocodile! Sadly it went the way of the rest of PEs historic areas, and urban decay set in. Although the building is still attractive and reasonably maintained, it is in a part of town where most citzens don't really feel safe to go, and the restaurant has long since closed. It looks like the old narrow gauge line come to the end of its life, as part of our transport infrastructure. At one time this line transported much of the fruit that was grown in the Langkloof to Port Elizabeth. Coaches can be seen decaying at many of the sidings along the line. These were photographed at the Greenbushes siding. 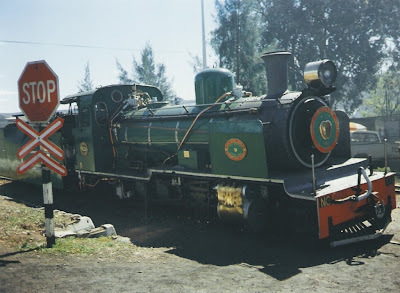 The narrow gauge Apple Express still runs every Saturday from Humewood to Thornhill and is a great family excursion. The train makes frequent stops along the way to allow trippers to get off and enjoy the scenery. 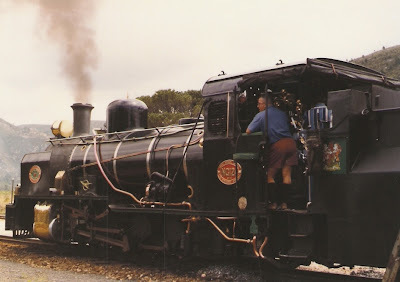 The practicality and efficiency of a diesel powered engine has replaced steam. This is such a pity, because Granny Smith and her "sisters" had a charm of their own and exuded the romance of a by-gone era. Travel up a normally uninteresting part of a street at the right time of the day and voila, it is transformed by a sunset into something special. The Oceanarium, with its dolphin shows, has been one of the icons associated with Port Elizabeth for many years. It has had its ups and downs, but an upgrade is planned, and it always offers an interesting time to tourists, as well as useful research on and help for marine species. Yes, yes, I know, the rules say 1 post of 1 picture a day, but I have just received 2 more stunning pix from the GIZA Regatta, and couldn't resist sharing them with you now! So consider it a bonus, from Port Elizabeth with love! Yachts jostle for position on the start line. 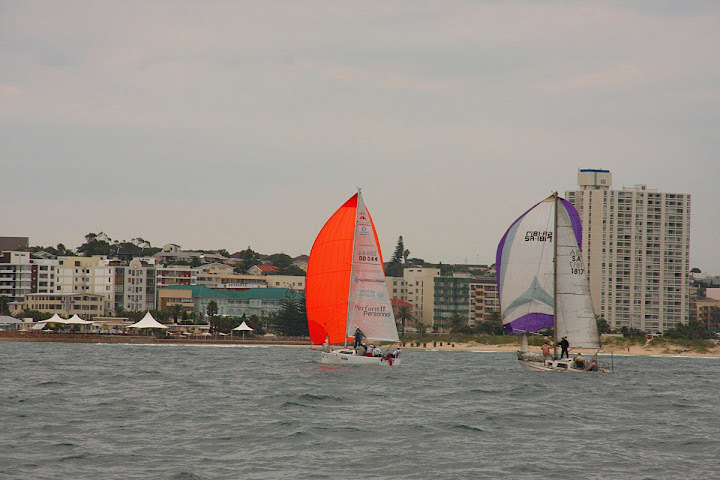 On the RHS on the bow is Scott Stephens part of the youngest crew sailing on Chris Frost from Durban's Pacer 3. The crew consisted of Thomas Ochabski (14), Scott Stephens (15), Michael Collier (15), Philip Straton (16), Luke Mann (19) and Chris Frost. Pacer 3 came 11th in Class 1 overall and 5th in the Pacer 27 fleet. Here are a couple more images taken by Leon Hugo for the Algoa Bay Yacht Club during the GIZA Challenge Regatta last weekend. In the top picture, colourful spinnakers brighten up a somewhat grey bay. 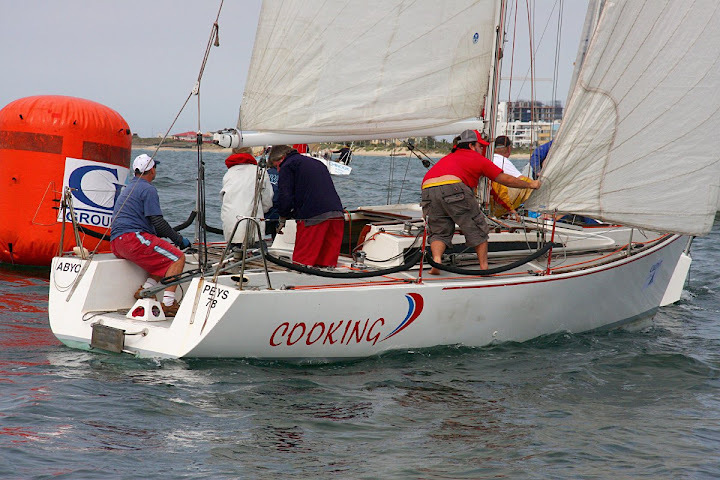 The bottom picture (pun intended) includes a bit of a bum view of the Commadore of ABYC, Alan Straton, (in black top and red shorts) on the yacht Cooking - a Ladd 27, owned by Gavin Stephens. 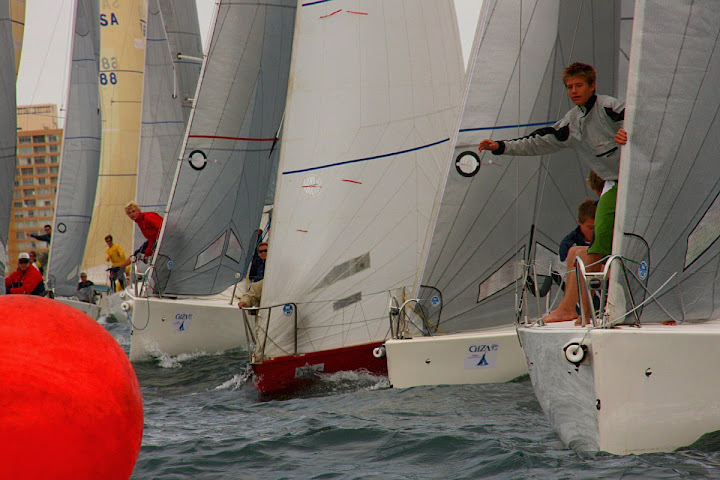 I particularly like this action shot because it shows the intensity of racing, as opposed to some of the previous relaxed shots we have shown of leisurely jaunts around the bay. No wonder Port Elizabeth is gaining a great reputation as a watersport capital. We recently showed you the swimming phase of the Ironman contest. This weekend PE was host to another major event. 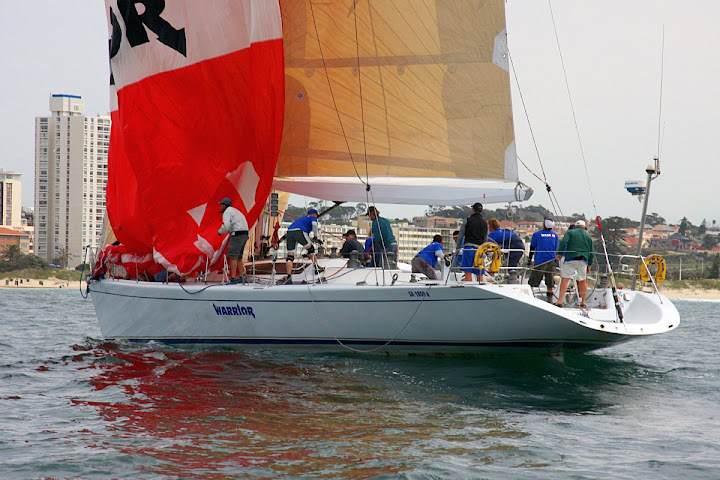 The GIZA Challenge is the Algoa Bay Yacht Club's premiere annual regatta attracting a strong fleet of local yachts as well as entries from around South Africa. 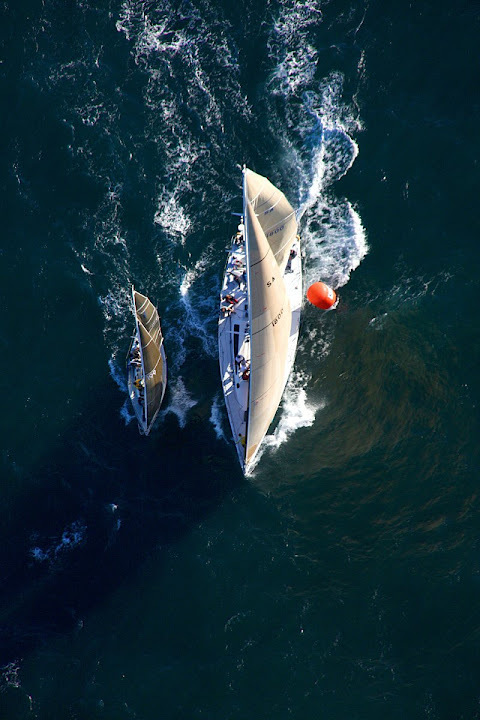 We are very grateful to Alan Straton, Commadore of ABYC, for sharing some of the photos they had taken during the event, by photographer Leon Hugo. 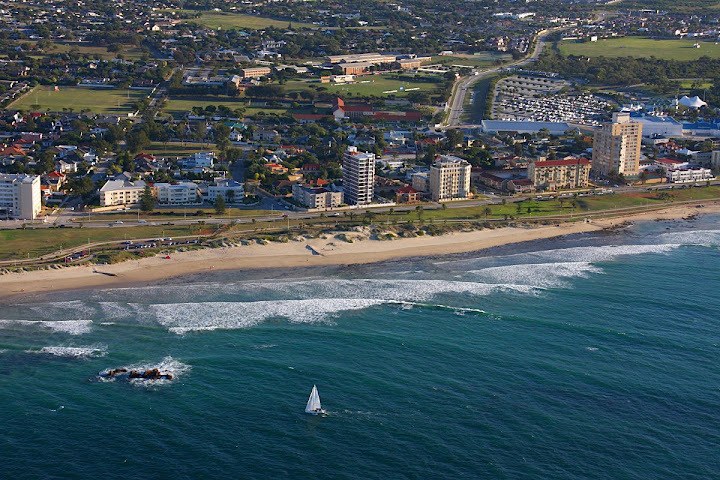 This is such a cool one because you get an unusual aerial view of our beachfront. We'll show more tomorrow..... thanks Alan! ............well it's just so photogenic! This was taken by our son on one of his visits home. We were away for the last 10 days, but thanks to the wonderful new scheduled posting innovation available on blogger, we posted ahead before we left. So thanks for all the comments, and we'll get back into visiting as soon as possible! The Sherwood Garden Centre is in one of the outlying suburbs, and is a great place for the whole family. The kids adore spending time at the playground and animal touch farm, while mom and dad shop for plants etc. There are beautiful walkways, this one features a fountain which can be seen from the coffee shop. This little bakery and supermarket serves the Richmond Hill area. As is usual throughout the world, Coke signs are all over it! Looking down from the flyover at the Russell road interchange. Port Elizabeth is a strange mixture of big City with a small town feel. It has areas that are historic, next to modern high rise buildings. Donkey carts share the roads with the latest hi-tech cars. This freeway system runs parallel to narrow little one way streets which were laid out in the early 1800s. There are so many ways in which numbers are invaluable in a City. 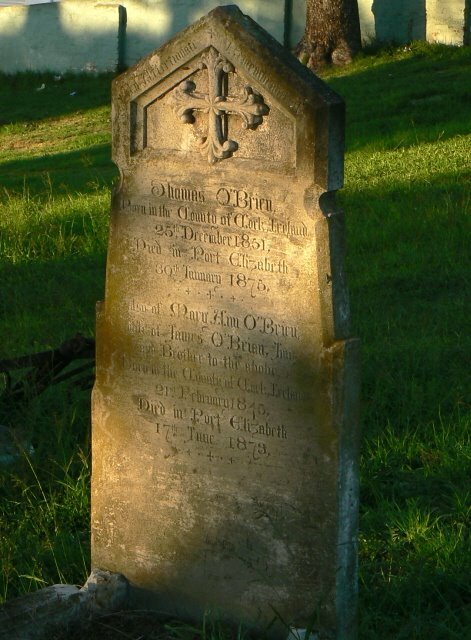 House numbers, telephone numbers, dates on buildings, and of course, they are particularly significant on headstones. So much of a City's history can be gleaned from the information on old gravestones, like this one in Russell Road. There were many Irish amongst the early settlers. Many City blogs around the world are participating in this Monthly Theme.